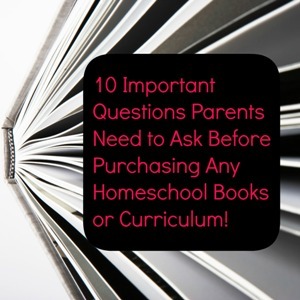 When Choosing Homeschool Curriculum & Books Ask Questions! Choosing Homeschool Curriculum and Books - Ask Questions! If you ask yourself these questions when choosing homeschool curriculum and books, you might save yourself some stress and aggravation. Many times when I have purchased a book or curriculum, I wondered why I didn't think and question myself more about why I needed this. 1. Does it fit our style? - your homeschool style and your child's homeschool learning style. 2. What do we want to get from this book/curriculum? 3. Does this fit into my homeschool budget? 4. Do I know someone who has used this book/curriculum? Is this a valid reason for me to get it too? 5. Do I know someone who doesn't like this book/curriculum and why? Is it a valid reason for me not to get it? 6. Is the book/curriculum user friendly or does it require extra preparation that I am willing to do? 7. Is there an easier way to accomplish our goal without purchasing this item? 8. Will I or my children feel burdened to complete this program or read this book? 9. Does this make sense to my child when they look at it? 10. Can more than one child use this now or in the future? Things always looks so good in the store or when you are talking to a sales person and then sometimes when you actually start using it, you realize that you didn't ask yourself these important questions. Invariably you WILL purchase something you don't like or need. Don't beat yourself up over it. It happens to every homeschooler. Either adapt it or sell it! It's pretty easy to sell homeschool materials when you are done with them too. Choosing homeschool curriculum doesn't have to be a chore or a dreaded activity. Just follow these guidelines and use my free homeschool planner and you will have a successful year. If you want some personal guidance, you can always get a homeschool coach that you can talk to for help. Your relationship with your child is more important than any amount of money you spent on a book or curriculum.